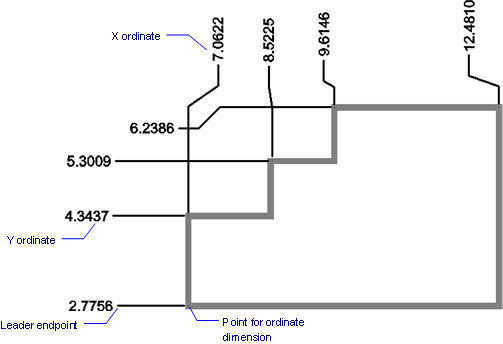 Dimensions in the x and y distances from the current UCS origin to the specified point in the drawing. The distance is measured from the origin (0,0) of the current UCS. Forces the ordinate dimension to measure the x distance; the distance is measured from the origin of the current UCS. Forces the ordinate dimension to measure the y distance; the distance is measured from the origin of the current UCS. Angle of dimension text - specify the rotation angle of the text. Dimension text - specify the replacement text. Select an ordinate dimension. Notice the grips. Drag the grip at the end point to relocate the endpoint; the leader and text remain fixed. Drag the grip on the leader to relocate it and the associated text. Drag the grip at the center of the text to relocate the entire dimension anywhere in the drawing. DimArc - Places arc length dimensions. DimLinear - places linear dimensions in drawings: horizontal, vertical, and rotated. DimAligned - places aligned dimensions. DimBaseline - places additional dimensions from a common baseline. DimDiameter - places diameter dimensions. DimRadius - places radius dimensions. DimCenter - places center marks. DimAngular - places angular dimensions. DimLeader and Leader - places leaders with text, blocks, entities, or tolerances. Tolerance - places tolerance tags in drawings. 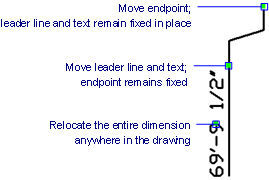 Dim - places and edits dimensions at the 'Dimensioning command:' prompt. Dim1 - places and edits a single dimension at the 'Dimensioning command:' prompt. DimEdit - changes the wording and angle of dimension text; changes the angle of extension lines. DimTEdit - changes the position of dimension text. DdEdit - edits dimension text. Properties - edits the properties of dimensions through a palette. DimStyle - creates and edits dimension styles through the Drawing Explorer. -DimStyle - saves and applies dimensions styles at the command line. Style - sets the text style used by dimensions. DimOverride - overrides the values of the current dimension style.